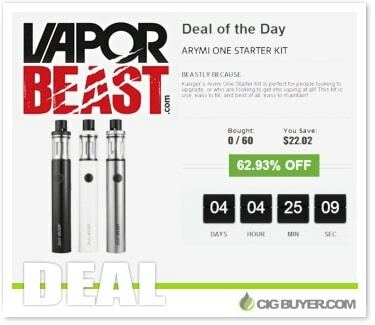 Kanger Arymi One Starter Kit “Deal Of Day” – ONLY $11.67! This deal may not be appealing to all of our visitors, but it’s a great deal nonetheless. If you’re looking for a basic, eGo-style vape pen, Vapor Beast has the Kanger Arymi One Starter Kit reduced to just $11.67! Normally retailing for close to $30, it includes a 2300mAh battery and a built-in Kanger Armor Tank that’s top-filled with 3ml of capacity. It comes with a 0.5 ohm SS316L coil and has a simple, one button design that’s perfect for beginners or anyone looking for something basic for on-the-go vaping.